HARWICH— Millions of people worldwide practice the ancient Chinese energetic art of tai chi chuan (taijiquan), known for centuries to promote deep relaxation and excellent health, to prevent injury, and to ward off or heal illness. Harwich author and teacher David Silver has recently been awarded, along with co-author Ramel Rones, the silver medal in the meditation/relaxation category of the Independent Publishers Living Now Book Awards, designed to honor the year’s best books that help readers attain healthier, more fulfilling, and productive lives. Their book, “Sunrise Tai Chi: Simplified Tai Chi for Health and Longevity,” currently holds steady as the number two bestseller among the thousands of titles available on the subject through online bookseller Amazon. Silver explains that he has always been interested in meditation and martial arts. He began training in goju¯ ryu karate at age 11, and studied taijiquan, qigong and yoga in his 20s. He was certified in 2006 to teach qigong by Dr. Yang, Jwing-Ming, an acclaimed author and teacher of kung fu, tai chi chuan and chin na grappling, a leading authority on qigong, and founder of Yang’s Martial Arts Association (YMAA) and YMAA Publication Center. Silver offers private and group qigong and taijiquan classes all over Cape Cod and works as a writer, producer, and director of instructional martial arts and health books and DVDs. In February of this year, he became only the second student in 35 years to be certified by Dr. Yang to carry on his legacy of researching, teaching and sharing (Qigong). The sight of a group of people in a park, gym or community center moving through the gentle flow of a tai chi form for relaxation, physical benefits and enjoyment has become a familiar one over the past decade or so. What may come as a surprise is the amount of hard data that has been gathered supporting the use of such energy work in the treatment of disease. Silver and Rones envisioned a book for beginners unlike the others on the market. Silver’s excitement about the success of “Sunrise Tai Chi” is about more than the book’s sales and popularity. It’s also about the auspicious timing of the announcement of the award, which coincides with a new project in the works. In addition to his teaching, writing, producing and directing, Silver finds time to volunteer for the nonprofit YMAA Retreat Center in California, a 10-year kung fu training program for exceptional students. Qigong is going to sweep the nation. Forget yoga and tai chi. Qigong is simpler. Watching the eight postures taught by David Silver of Harwich, who is certified by the Yang’s Martial Arts Association (YMAA) is like watching honey drip from a spoon. He makes it look as effortless as breathing. Actually, qigong (chee-gung) is all about breathing. But, correct breathing from deep in the abdomen. Combine deep breathing and concentration with slow movement and concentration and you’ve got something that will impact the quality of your life from physical health to an upbeat outlook. He discovered why. Historically, masters did not reveal the secrets of the art to the public. A student had to earn trust so he sought a teacher to study with. Then the pieces began to fall into place. Silver discovered the book, “Qigong, The Secret of Youth,” by Dr. Yang that clearly answered his questions. And he practiced in Boston where Silver wanted to relocate. “I enjoyed playing drums but you can only do that for so long.” He was ready for something different. When he got to Boston, he took the first jobs that came along – at a surfboard store, and tending bar. Then, he called Dr. Yang. “I said, ‘Hi, I want to study with you.’ I asked him for a job and told him that I wanted to do something more meaningful with my life.” Impressed, Yang set up a meeting. By this time Silver was nervous. They met and talked. Although he had no openings in his business, Yang’s Martial Arts Association, he created one. Silver went to work in the warehouse shipping books, tapes, cds, videos and clothing. He moved to the publishing department, and eventually ended up heading their video department, an interest he’s had since childhood. Meanwhile he trained in tai chi with Master Yang to learn the associated form, qigong. “Qigong is the energetic framework within tai chi postures. It’s an internal art, as opposed to an external art like kung fu which works on building the outer physical body first and developing internal energy later.” Silver took regular classes, side classes, lunch break classes, three-day weekend seminars, private classes and night classes. Over a five year period, he took every class available and even repeated a few. There was nothing left but to teach. “I had no intention of becoming an instructor. I just enjoy the subject and my own practice. But I felt I had to test myself with Dr. Yang. He has only certified a few people in the last 25 years.” Yang’s test was simple. Pull some questions out of a box and discuss. But mastery of qigong is complex and includes knowledge of anatomy and Chinese medicine. Silver passed, and Yang told him he was to carry the message to the next generation. Through the miracle of electronics, Silver now writes, directs and produces instructional martial arts and health DVDs from his home base on the Cape. He has also cowritten a book based on his most popular DVD. 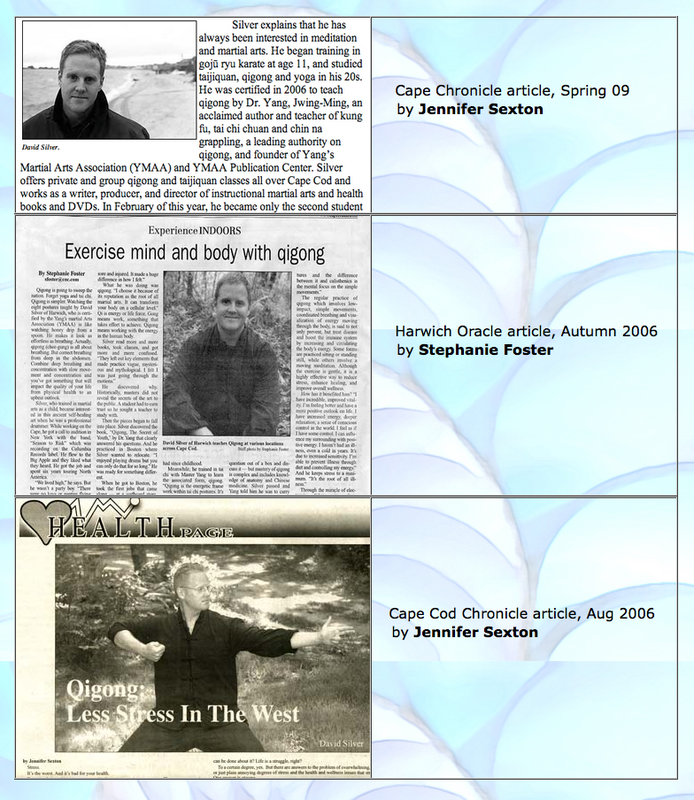 He also teaches private and group qigong classes, a boon for the Cape since you can’t find qigong classes just anywhere. It’s the worst. And it’s bad for your health. Everyone knows that we are supposed to be trying to reduce our stress. There are new stories about it on the television news just about every night, sandwiched in between the rising global temperatures and the latest super-influenza strain to watch out for. Stress attacks your emotional well being, bringing about feelings of fear, distrust, anger, and depression. In turn, these feelings may bring about headaches, upset stomach, insomnia, ulcers, skin rashes and eyelid twitches, not to mention the even more serious problems of hypertension, heart disease, and stroke. Stress wages war on the immune system, making us less able to resist diseases of all types. Scientists have even revealed a clear connection between stress and cancer. Stress is the worst. But what can be done about it? Life is a struggle, right? To a certain degree, yes. But there are answers to the problem of overwhelming, debilitating, or just plain annoying degrees of stress and the health and wellness issues that stress presents. One answer is qigong. Now, what the heck is qigong? And how do you pronounce it? Qigong (chee-gung) is an ancient Chinese self-healing art that combines movement and meditation. Regular practice of qigong has been proven to prevent and treat disease, establish balance, bring peace and integrate body and mind while enhancing and bolstering the immune system. You may have seen qigong written as two words, or even spelled differently. This is due to the fact that Chinese is a pictorial language, and for many years the phonetic translations of the Chinese language into our alphabet were quite open to individual interpretation. In the 1940s, the Chinese created an official transliteration called Hanyu Pinyin. The official spelling was established as qigong, though Westerners still use many spellings and remain largely confused about the spelling of qigong, as well as in general. At a qigong class, expect to be relaxed. Classes are typically held in healing spaces, such as yoga schools or centers for acupuncture or chiropractic care. Loose clothing is best, and whether or not to wear shoes is purely up to you. Qigong movements are very low-impact, simple movements, coordinated with breath and visualization of qi moving in the body. Specific postures and movements are used to help move energy through specific pathways, known as meridians. Classes usually last about one hour, beginning with a stretching and gentle warm up and working into a sequence of qigong movements and ending with a cooling down section in which individuals find their centers, gather energy, and hold it there. “The movements are very relaxing. Anyone with any experience level will gain benefits from even one class,” says Silver. There were no openings for employment at Yang’s martial Arts Association (YMAA), but after hearing Silver’s story, Dr. Yang created a job for him. Over the years, Silver worked his way up through the YMAA Publication Center from unloading trucks to his current position, running the video department, where he writes, directs and produces instructional martial arts and health DVDs. As he advanced though the ranks at the YMAA Publication Center, he also advanced in his study of qigong. Today he is one of a handful of individuals certified by Dr. Yang as YMAA qigong instructors. There is every reason to anticipate the same sort of surge in growth and expansion of interest in qigong here in the West as has been seen over the decades for other now beloved Eastern practices like yoga and tai chi. Qigong offers a wide range of health benefits, as well as the opportunity to simply turn the attention inward, at least for the duration of a class, something we busy and distracted Westerners can certainly benefit from.